The colder autumnal weather means a few things for my hair; harsh temperatures from blow drying and central heating, being stuffed into a bun to tame it in the wind, and the inevitable static from pulling cosy knits over my head. As someone with dry and fine hair, the outcome is always the same: frizzy, tangled and wild. So what's a girl to do? Thankfully the John Frieda's Frizz-Ease* haircare range exists, and it's designed for exactly this purpose. It's not only thick curly hair that needs taming, and John Frieda have everyone covered. In an attempt to lessen the damage on my hair and to keep it nice and sleek I've been trying a few products from the range. 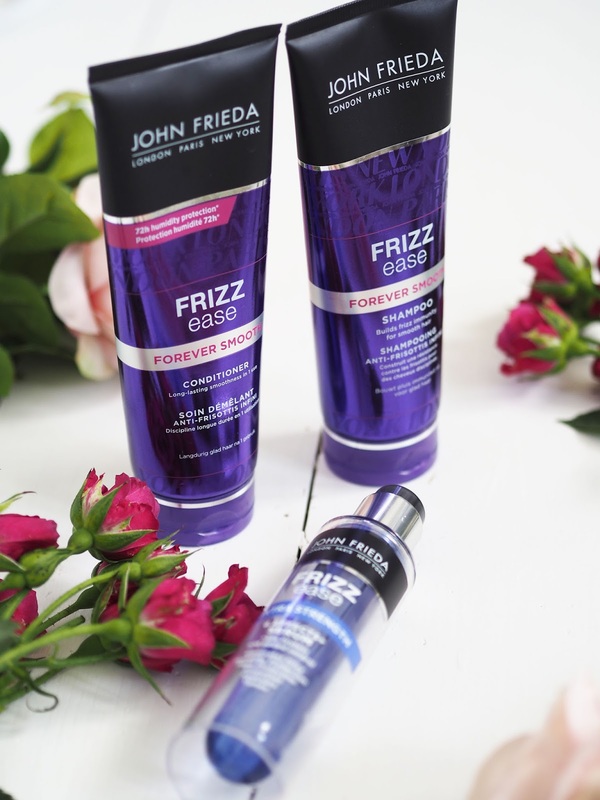 This is a full regime in order to keep things smooth and sleek from the get go, so first up is the John Frieda Frizz Ease Forever Smooth Shampoo* and Conditioner*. When used together, both products are formulated to give you luxuriously smooth and frizz free hair from the first use and to keep it that way. The John Frieda Frizz-Ease Forever Smooth Conditioner* however, is where it's at for me. Best worked into the lengths and combed through, after rinsing off the conditioner my hair is the most smoothest I think I've ever seen it without using straightening irons. Not a tangle or any frizz in sight! The conditioner also helps keep your hair smooth and free of tangles and frizz for 72 hours, which it most definitely does. I tend to get quite warm in the night which can often lead to my hair looking rather disheveled and frizzy in the morning but not since I started using this, which means I save both time in the morning and limit any extra heat damage to fix it. I couldn't not mention the product that started it all - John Frieda Frizz-Ease Extra Strength 6 Effects+ Serum*. It's the product we all know, right? I've used this off and on for too many years to mention. John Frieda kindly sent me the extra strength version, and it doesn't muck about. I love serums and hair oils anyway so this has slotted nicely into my routine. Even though it's a more heavy duty formula it's perfect for my fine tresses. It's only used on the lengths and ends anyway so doesn't weigh down my hair or make it greasy. The John Fried Frizz-Ease Extra Strength Serum is a bit of a multi-tasker, aiming to eradicate frizz and leave your hair smooth and silky, while also protecting it from heat and humidity. If you tend to use quite a few different products on your hair then this could easily replace several of them in one go. I add a pump to drenched hair and work it all through the lengths before drying and the difference it makes is quite noticeable, especially the shine that my hair now has. Colour-junkies will adore this serum I'm sure! 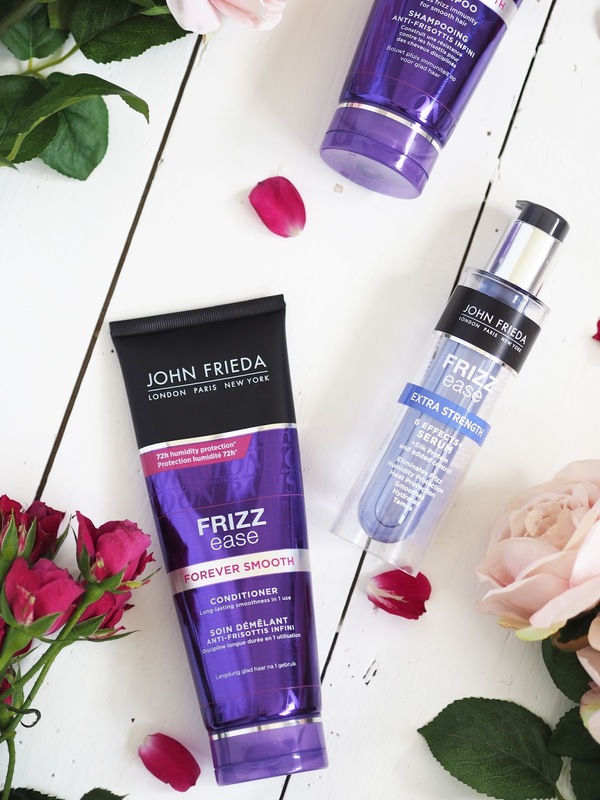 Have you tried anything from John Frieda before? 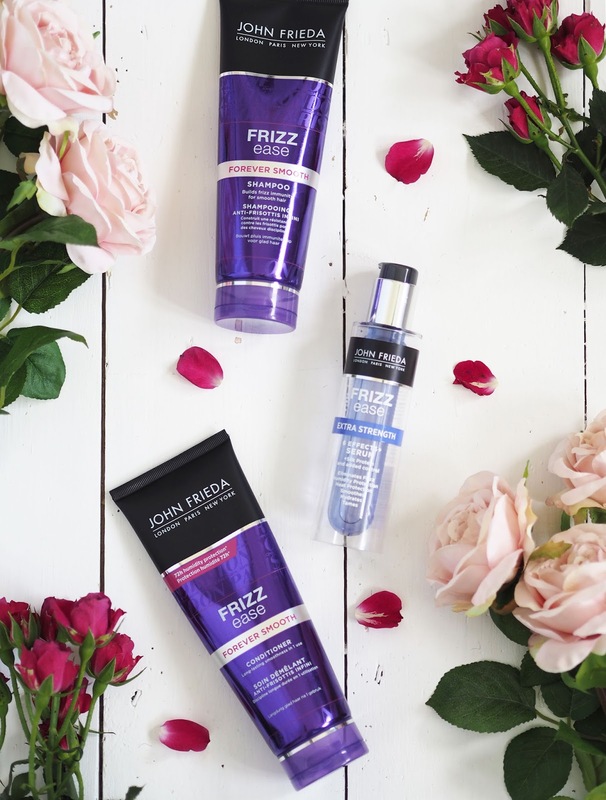 The post Combatting Frizzy Hair With John Frieda Frizz-Ease appeared first on Lelore.